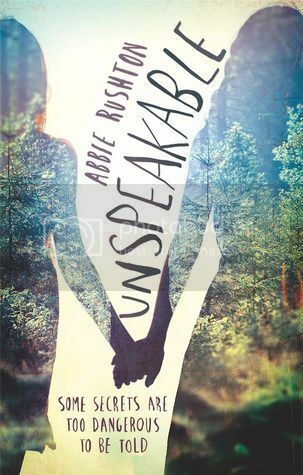 Unspeakable by Abbie Rushton (review copy) - Megan doesn't speak. She hasn't spoken in months. Pushing away the people she cares about is just a small price to pay. Because there are things locked inside Megan's head - things that are screaming to be heard - that she cannot, must not, let out. Then Jasmine starts at school: bubbly, beautiful, talkative Jasmine. And for reasons Megan can't quite understand, life starts to look a bit brighter. Unspeakable by Abbie Rushton sounded like a really good story when I first heard about it, so I was excited to give it a go. But I'm afraid to say it was a bit of a let down over all. Megan hasn't spoken in months, keeping a tight lid on a terrible secret no-one must ever know. But then new girl Jasmine starts at her school, and a friendship is formed pretty quickly, despite Megan never uttering a word. Jasmine treats Megan just like she's anyone else, and with Jasmine's friendly, sparkling personality, Megan is like a moth to a light bulb. Soon Megan finds herself feeling things for Jasmine that confuse her, and scare. Jasmine makes her want to talk, but if she talks everyone will know what she did. I started reading this book with high hopes. It started off quite well, and I was really intrigued with the premise of the story, and how the relationship between Megan and Jasmine would develop. It was gripping enough to keep me turning the pages, I was interested, but from about half way through, I stopped really caring. I found the characters became annoying from about halfway through the book. They felt less believable to me, more like caricatures of people. I wasn't a big fan of Megan, and she annoyed me more than once. She was full of irrational anger, and could be so unreasonable with her mother, who she wasn't particularly close to, and who struggled with her silence, not being a mind reader. She was the same with other characters when they did things she disagreed with. She could be a little selfish, and I really didn't like those moments. She would dress it up as if she was worried for people, but it just looked like jealousy-fuelled frustration and anger. There was one moment when she had a right temper tantrum, and it made me raise my eyebrows in disbelief, thinking "Really?" When it came to the romance aspect of the story, I found Megan's side of things pretty realistic, if a little too much what with her being down on herself all the time, but I just didn't get where Jasmine suddenly seemed to feel something out of nowhere. There didn't seem to be any build up to that, no real clues beforehand. I had read in previous reviews that there was a romance, but I spent most of the book thinking Unspeakable was more a story of unrequited feelings. I just didn't feel it from Jasmine. With regards to the mystery, there was one part of it that I figured out early on, because it was so glaringly obvious, but I didn't exactly see the truth behind the whole reason Megan doesn't speak coming. Although that side of things was intriguing, and the main reason I was reading, the revelation seemed to be dealt with fairly quickly, and then the story moved on. It felt... not rushed, exactly, but that it let it go too fast. Megan has been dealing with this for so long, I just expected there to be more when it came to the big reveal, or at least after it, with how Megan copes with it. I finished the book with a general feeling of disappointment. It wasn't a bad story, but not as good as it could have been. I'm left feeling pretty "meh" about the whole thing. But I've heard other people really enjoyed it, so read a few other reviews before deciding whether to read it or not. Yeah, I was really disappointed with this book too. I WAS SO EXCITED FOR IT. I love the cover and the premise. But the actual book just felt like it lacked something. I actually didn't mind all of Megan's anger and selfishness – I thought it was pretty realistic for a teenager. But everything else just felt really flat and I really didn't like the climax and ending at all. Yeah, I read your review, so I was kind of prepared to not like it much, but at the same time, I was thinking ,"It sounds so good! I'm sure I'll love it!" Yeah, not so much. I don't know, I've never known teenagers to be that selfish and unreasonable. It just seemed too much to me. But that's a problem with the character rather than the book. But that ending. Meh. Just didn't really cut it.